Outline In the search for Gabriel, Sam and Dean turn to Rowena for help. Meanwhile, Castiel visits Heaven and is shocked by what he finds. At an art gallery gala in Portland, Oregon, Rowena is standing at the bar when she receives a phone call from Sam, Dean, and Castiel. Seeking her help, Castiel attempts to explain the situation with Apocalypse World Michael but is simply shrugged off by Rowena who explains she would love to help but is in the middle of her own "project" in the Pacific Northwest. Sam and Dean continue to try and persuade Rowena, telling her the world is in danger, but they meet with continued indifference from Rowena who wishes them luck before hanging up on the three. Rowena soon spots a women, Elizabeth Mahler, and approaches her, mentioning having seen her in the newspaper, a fact which makes Elizabeth uncomfortable. Rowena apologizes and upon hearing tango music, decides to dance with her bodyguard, Bernard. As the two tango, Rowena mutters the phrase "Mors Lumena" at Elizabeth, which causes her to spontaneously combust. In the Bunker kitchen, Dean and Castiel are discussing their options to try and track down Gabriel without Rowena's help. Castiel suggests Heaven may be able to help them, but Dean is apprehensive about the idea given Castiel's status among the angels. Sam soon enters the kitchen with news of a spontaneous combustion in Portland. Realizing it was probably Rowena, Sam assures Dean that he will keep his promise and take care of Rowena if she has gone bad. Dean, frustrated at everything that is happening, relents and tells Castiel to ask the angels for help. At the Playground, Castiel calls out the guard, Indra, whom he finds drinking in the jungle gym. He tells Indra he wishes to enter Heaven, and meets no resistance. Seeing the bottle in his hand and various others strewn about the playground, Castiel asks if Indra is drunk. Indra denies it, but tells Castiel that at the pace he is going he is taking the edge off, before offering to let Castiel kill him and say they battled. Indra's increasingly disconcerting behavior worries Castiel, who asks what is wrong, only for Indra to tell him to see for himself, wishing him good luck as he enters the gate. In Heaven, Castiel wanders the corridors, finding himself in Heaven's Throne Room, where he spots Dumah and two other angels in the distance. He tells her of the situation involving Gabriel, Michael, Lucifer, and Jack. When the lights begin to dim and flicker, Dumah tells Castiel they need to talk. Later that night on the road to Portland, Sam and Dean continue to try and contact Rowena, to no avail. A female voice comes suddenly from the backseat of the Impala. Seeing the reaper Jessica sitting in the backseat, Dean slams on the brakes and pulls over on the side of the road, exiting the Impala with Sam to find Jessica standing in front of them. She reveals to the Winchesters that she has been tasked by Billie/Death to be a "baby monitor", and keep an eye on the brothers. She tells them of the people dying before their assigned times in Portland and says she has been authorized to offer her assistance should they need it, which Sam rejects. In a hotel room, Rowena sits at a desk fondly looking at the childhood portrait of Fergus, remarking to Bernard that she is becoming too sentimental, as the Winchesters continue to call her. She tells Bernard that nothing will get in her way and stop her from fixing things. As her eyes glow purple, she states that she is capable of anything now. At the scene of Elizabeth Mahler's death, Sam informs Dean of Elizabeth's background and how her company caused deaths due to improperly labeled medications. Dean notices another pile of ash just behind where Elizabeth died, despite there only being one victim. Sam realizes he has seen something like that before, and finds lore revealing that the ash belongs to a reaper. Exiting the art museum, Dean calls for Jessica, who swiftly appears in front of them. Jessica explains that Rowena is changing people's fates by killing them and their reapers before their time, the ripples of which, if not stopped, will cause Death to effect a reset and cause a mass kill-off to "sweep the board clean." When Dean questions why Jessica doesn't just stop Rowena, she tells Dean of Death's new rules regarding no direct interference. She also reveals that in all of Rowena's possible death's, it is Sam who kills her. In Heaven, Castiel continues waiting in the Throne Room. Annoyed at being forced to wait by Dumah, Castiel demands to know what she meant when she said that they could help each other. Dumah tells Castiel that if he can bring Gabriel back to Heaven they can help him with Michael and defending Earth. When Castiel's retorts that he has come to Heaven for their help in finding Gabriel, Dumah begins to reply when they are interrupted by Naomi who tells him it's not that they won't help him, but that they can't. In Baby discussing the case, Sam finds that the only person from Pirodine Pharmaceutical that Rowena hasn't killed yet is the CEO, James Melford. Suddenly Jessica appears in the backseat and tells Sam and Dean that Melford is dying, and that his time of death has shifted to "now." In his backyard Melford lies on the ground bleeding, pleading for his life to Rowena, who tells him he should consider it a blessing he is helping someone with his death after all the pain and suffering he caused. Rowena scans the area until she finally spots Melford's reaper. She asks him if he has a message from his boss. The reaper, Martin, tells her Death does not negotiate with witches, which causes Rowena to incinerate Melford as well as Martin. Arriving in the aftermath, Sam and Dean soon receive a phone call from Rowena asking to meet with them at a hotel bar to explain what she is doing in person. In Naomi's office, Castiel questions how she is alive. Naomi explains that after Metatron's attack and the Fall, she had her most trusted angels spread the rumor of her death while she recovered. As the lights continue to dim and flicker, Naomi reveals to Castiel that the angels have dwindled in number to eleven total, including Castiel, all of which are keeping Heaven powered. With so few numbers, they cannot risk sending any angels to aid in Castiel's search for Gabriel. But if Castiel can locate him, and bring him home, the power of an archangel will be enough to keep Heaven going. If he cannot find Gabriel, the angels will eventually burn out and Heaven will crumble, releasing billions of souls onto the Earth. At a hotel, Sam and Dean wait for Rowena at a table in the bar. She sits with the boys and explains she is trying to get Death's attention, because Death has something she wants -- her son. Blaming herself for Crowley's death and the path her abandonment led him down in life, she tells the Winchesters they aren't the only ones that get to come back from the dead and that she is putting Death on notice. As Sam goes to place the binding link handcuffs on Rowena, they pass through a purple haze and the Winchesters realize Rowena is not really there. From across the bar, they see her make her escape with Bernard. Giving chase, Sam pursues Rowena as Dean is stopped in the hallway by Bernard. The two fight while Sam stands off with Rowena in the alley behind the bar. Rowena taunts him into firing a shot, then stops the witch-killing bullet just before it hits her. Shocked that Sam shot at her, she renders him unconscious. As Dean continues to fight Bernard, Jessica appears and encourages Dean to hurry up. Eventually Dean is able to choke out Bernard, but by the time he makes his way outside to the alley, Sam and Rowena have already disappeared. Sam regains consciousness restrained to a chair in Rowena's hotel room. He tries to appeal to Rowena, telling her that her power has made her go crazy. Rowena corrects Sam, explaining it has given her clarity, that her drive for power and wealth has taken everyone she loved from her. Understanding that she is a "flawed, petty, evil creature," she tells Sam she has to try and redeem herself. She apologizes to Sam, then tells him that if she kills him then she can't be stopped. She begins a spell which causes excruciating pain to Sam, but also prompts Billie to finally appear. Billie tells Rowena she is upsetting the natural order and orders her to stop. Rowena says that she will, if Billie brings back her son. Billie flatly responds with a "no." Rowena threatens to kill Sam, but Billie tells her to go ahead because she is curious what will happen. As Rowena turns her knife towards Sam, she breaks down and can't bring herself to kill him. Turning towards Billie, Rowena unleashes her full power, which does not faze Death. Collapsing to the floor, she asks if Death will take her now, only for Billie to comfort her about her loss, telling Rowena she knows how her story will end. As Dean bursts through the door, Billie greets him, ominously telling she will see him again soon, before disappearing. At the Playground, Naomi tells Castiel the angels will continue to do their part and keep Heaven going as he looks for Gabriel. He assures her they will fix "this". Naomi responds that everything ends, but until then, the remaining angels will do their part and the gate to Heaven will be closed. Stepping onto the sigil, Naomi ascends to Heaven, erasing the spellwork in her wake. Back at Rowena's hotel room, Sam, Dean, and Rowena sit on the floor drinking. Rowena remarks she feels weaker after facing down Death, wondering what she has done. Sam tells her that she could have killed him but didn't, and that is progress. Sam tells her what happened with Crowley wasn't her fault, and Dean tells her Crowley made his choices, and they are all living with past mistakes. 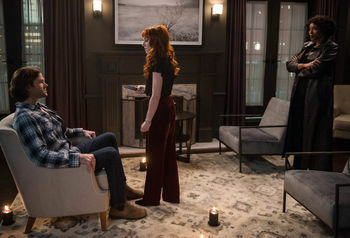 Sam tells Rowena that they need her help to save their family and world, with Dean telling her it would be a big step for her to redeem herself. They remind her that if she changed other people's fates, they can try and change hers before asking if she is "in." Dean: A rich lady exploded? Sam: Yeah. Uh, local cops are -- are calling it spontaneous combustion, but... pretty much. Dean: Okay, all right, all right, that's not cool, okay? That's -- First of all, that's a classic. Secondly, the burger's for emergency cases only. Dean: I don't like it. I mean, what's the over/under this is a trap? Sam: Well, it's Rowena. Of course it's a trap. Naomi: Well, then, let me make it divinely simple for you. There are a grand total of nine angels in Heaven, present company included. And one or two on Earth, and... that's all. We are the last men and women and divine waves of light still standing, as it were. Naomi: You wanna know why we can't help you? Because none of us can leave, We're the only things keeping the lights on. Barely. We need everyone, especially an archangel. Now the others thought any archangel would do. Long story. But your news about Gabriel is... for lack of a better word, blessed. With his power, we can keep Heaven running. Naomi: Without him, in time, we'll burn out. Heaven will crumble, and all the souls that have been entrusted to our care will fall back to Earth. Picture it, Castiel -- billions upon billions of ghosts unleashed upon the world. All that chaos, all that death. Sam: Yeah? Then why are you killing reapers? Rowena: Well... they're just a means to an end. It's not easy to get Death's attention. Dean: Well, trust me, that's not the kind of attention you want. Rowena: Oh, but it is. Death has something I want. Rowena: My son. After you told me he was gone, how he died, I had an unexpected reaction. We had our differences, but it's my fault he went down the path he did. I left him. Dean: We're talking about Crowley -- demon, King of Hell. Rowena: We're talking about Fergus -- a man abandoned and loveless, tricked by a demon, died in a gutter. He deserved better from the world, from me. Dean: Well, Crowley's dead. There's no coming back from that. Rowena: Oh, is that so, Dean? Are only Winchesters allowed to come back from the dead? The rest of us just have to accept it? I don't think so. I'm putting Death on notice. Sam: No. No, no, no, no, no. No. Rowena. I know what you went through and I know how much you lost and I realize how much you want your family back. But don't do this, not like this. This is no you. Not anymore. Rowena: What happened to me, those were my choices. But Fergus never... It wasn't fair. It's not fair! Billie: You were never gonna kill him. There was a time you would've, but not now. I can see that. Rowena: I don't know what I'm doing. Billie: Sometimes life is unfair and sometimes we lose things and sometimes we make mistakes. And some of these things can never be fixed no matter how powerful you become. Some things just are, and everyone has to live with that. Rowena: I fought Death and lost. I feel tired. Weaker. I don't know if it's forever. Sam, what have I done? Sam: You had a chance to kill me and -- and you didn't. I'd call that progress. Dean: I'd call that a miracle. Sam: And, you know, what happened with Crowley, that wasn't your fault. Rowena: He never had a chance. Dean: He made his choices. Just like we all do. Look, every one of us has done something that we have to live with, that we're trying to make up for. Every one of us. Sam: Yeah, well, we, um... We may need your help to save our family, to... hell, to save the world. Dean: You wanna be redeemed? This would be a pretty big step. Rowena: And you think I still can be? Sam: We both do. But before you answer, you gotta know something. Um... Lucifer is back. Rowena: Mm. Of course he is. Rowena: Breakdown? Crack apart in terror? Of course I'm horrified and scared. My heart may have stopped, but... Lucifer isn't the one who's gonna kill me, is he? Sam: You changed other people's fates. Maybe we can change yours. Dean: So... What do you say? You in? "Funeralia" comes from the Medieval Latin for "funeral rites." One of the paintings in the art museum comes from a series of paintings by Vancouver-based artist Jay Senetchko titled “The Course of a Distant Empire,” which deals with the cycle of creation and destruction. Rowena: Oh! The handsome angel is there isn't he? Hello, Tweetie Pie. "Tweetie Pie" is the title of the first Merrie Melodies short which paired together the characters of Tweety and Sylvester. Sam: Rowena, are you at a... party or something? Rowena: I am, but I'm surprised you recognize the sounds of a party, seeing as how you're all work and no play. "All work and no play" is a reference to the proverb, "All work and no play makes Jack a dull boy." This phrase was famously used in Stanley Kubrick's The Shining. Dean: Look, we didn't call to talk, we... The world is in danger, Rowena. Rowena: And I'm currently surrounded by art that makes me think the world should be in danger. Best of luck to you, boys, my three little musketeers. Mwah. The Three Musketeers are the eponymous characters in the 1844 novel by Alexandre Dumas, which follows the adventures of three soldiers in 17th century France. Dean: Uh, not for nothing, but don't the angels mostly wanna kill you? Castiel: Yes. Yeah. This would be something of a Hail Mary. Castiel: It's a sports term. Like slam dunk or, uh... ball handler. In sports a Hail Mary move is a bold one made in desperation, often used to refer to long passes in American football where it originated. A slam dunk is a move from basketball. A ball handler is also a position in basketball, despite Dean's obvious implication of an innuendo. Sam: Yes, of course. Uh, uh, one small mistake can -- can cause all kinds of bad. What about it? The Butterfly Effect was first articulated by Edward Lorenz from his work in simulating weather patterns. It is the idea that a small change in a system can have large effect - i.e. a butterfly can flap its wings and ultimately cause a tornado. Dean refers to the 2004 movie The Butterfly Effect starring Ashton Kutcher. Dean, however, breaks his number-one rule as stated in 6.17 My Heart Will Go On: "No Kutcher references." As Sam and Dean were in an alternate timeline where the Titanic didn't sink at the time, that rule may have been one of the various results of Balthazar's interference with fate. Much like Jim Beaver, Mark Sheppard, Mark Pellegrino, Felicia Day, and Richard Speight, Jr. before her, Amanda Tapping's name was credited at the end of the episode to keep her appearance a secret. Rowena: You... I know you. Billie: We met when I was a reaper. Rowena: We totally did! If we’d just exchanged numbers none of this would have been necessary. Rowena and Billie are referencing the time when they were helping Chuck battle Amara in 11.23 Alpha and Omega. 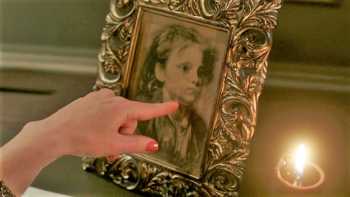 In her hotel suite, Rowena had an old picture of Crowley from when he was a boy in his human life. 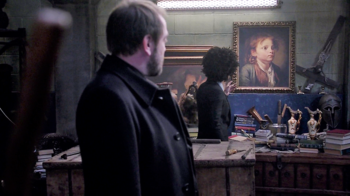 Crowley had a similar painting in his personal lock-up which was seen in 11.15 Beyond the Mat when he went to retrieve the Rod of Aaron.